If you’ve ever wondered just why vampires have such a problem with thresholds, then you may be reassured to know that you’re not alone. There’s been a lot of work by social anthropologists and folklore researchers on this and related questions. What they’ve found is, among other things, that vampires don’t just have a problem with thresholds. Vampires also have problems with crossroads in many stories. Crossroads, in turn, are not just an issue for vampires. In a lot of stories, crossroads are a place for meeting the devil, and in a lot of cultures, they’re a place for executing criminals and for burying social outcasts. The common theme that emerges from research in this area is that most societies have a problem with places which involve significant transitions. A lot of those places are viewed as sacred, such as temples. Usually those spaces are kept separate from the ordinary world by physical boundaries, such as ditches and walls. The banner image shows the boundary ditch for Avebury, an enormous henge monument that makes Stonhenge look like small stuff. That boundary ditch was originally over eleven metres deep and over twenty metres wide. A ditch that size is making a significant statement about just how important the boundary is between the outside world and the space enclosed within the ditch. Usually, people have a problem with the place where you move between the ordinary world and the non-ordinary one. That boundary place is neither one thing nor the other, and people tend to find this uncomfortable. One common result is the use of a special transition space. 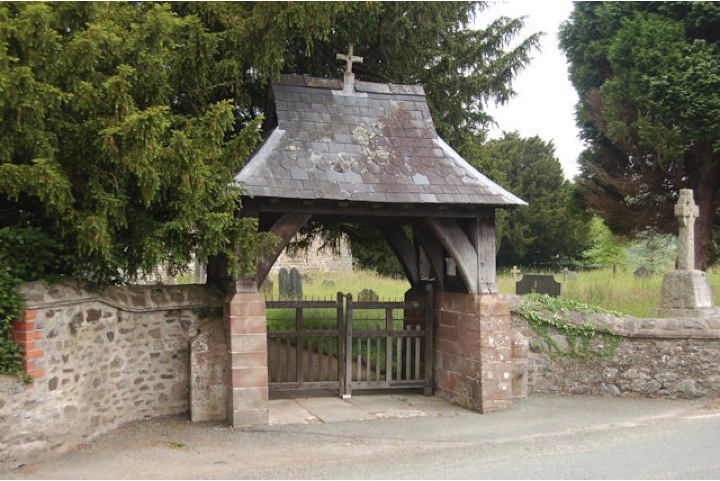 In many British churches, this takes the form of the lych gate, such as the example below. “St Michael’s Manafon lych gate” by John Firth. Full link and details at the end of this article. Transitional places such as these are known in social anthropology and related fields as liminal zones, from the Latin limen, meaning “threshold”. Most societies have strong conventions about how you behave when you enter a liminal zone; a common example both for sacred places and for ordinary homes is taking off your shoes in the liminal zone. The concept of liminal zones can also be applied to time, usually in the form of life events, such as the transition between childhood and adulthood. The Wikipedia article on liminal zones gives a good initial overview of this concept. I’m not going into the time issue in this article, for reasons of brevity, but it’s a fascinating topic. Returning to physical liminal zones: These take various forms. Usually, they’re the boundary between two types of space, but sometimes an entire space may be liminal. Hotels are a classic example. They’re neither completely a public building, because you use them for private activities such as sleeping, not completely a private building, because they’re available for anyone to stay in. Moving rapidly on from that disquieting thought: Seaside towns are also boundary places in other ways. This takes us into the world of social geography and economics. One of the neat concepts of social geography is Thiessen polygons. 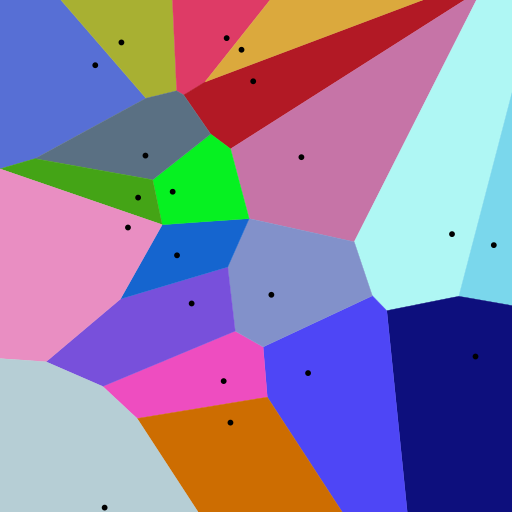 They’re a subset of what is known mathematically as Voronoi diagrams. The core idea is that if you plot the mid way spaces between towns, then you can see regular polygons around each town. This effect appears particularly clearly in homogeneous landscapes, such as the Dutch countryside, where there aren’t distortions in the polygon distributions due to mountains, moorland, etc. Here’s a hypothetical example, from Wikipedia. In this diagram, each black dot can represent a town, with the coloured area around each dot representing what’s known as the hinterland of the town. The hinterland provides most of the resources used by the town, such as food, people to staff the town’s essential services, etc. Often, the size of the hinterland corresponds to critical distances in antiquity, such as the maximum feasible distance for traveling to a market and returning the same day without having to stay overnight in the town. Seaside towns have only half as much terrestrial hinterland as inland towns. This isn’t a huge problem when a seaside town is successful; in those times, the sea provides access to a “virtual hinterland” in the form of trade from other ports and of harvests from fishing, etc. However, this becomes a significant problem when a seaside town isn’t successful. The problem is compounded because seaside towns will often get less passing traffic than inland towns; there may be coastal traffic, but that seldom compares in volume with the traffic that passes through an inland hub. So, there are practical reasons for some liminal zones being different. However, that doesn’t explain why liminal zones are such a big issue in religion and mythology. I think that the explanation for religious and mythological liminal zones being so important involves a couple of usual suspects, namely human categorisation, and human problems with Necker shifts. In a previous article, I discussed the problems that arise when you encounter an ambiguous situation, where one possible explanation is harmless, but the other possible explanation is threatening. I linked the underlying cognitive mechanism back to the concept of the Necker cube, a visual illusion where a wireframe drawing can be perceived in two mutually exclusive ways. Here’s the wireframe drawing. 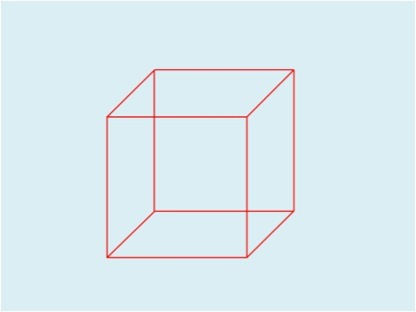 Here are the two ways in which the drawing can be perceived, either with the front of the cube at the bottom left, or with the front of the cube at the top right. I think that this is probably what’s going on with liminal spaces. You don’t know which category a liminal space falls into; whether it’s part of the safe, ordinary world, or part of the scary non-ordinary world. I think that a similar effect underlies the phenomenon of the uncanny valley, a phenomenon named by the Japanese robotics researcher Masahiro Mori. He found that the more human-like a robot is, the more people like it, up to a point where suddenly people aren’t immediately sure whether they’re dealing with a machine or a human. Most people find that ambiguity deeply unsettling. This concept has been picked up by researchers interested in human perceptions of human-ness. For instance, corpses and most of the monsters in horror movies are in the uncanny valley between definitely human and definitely not human. 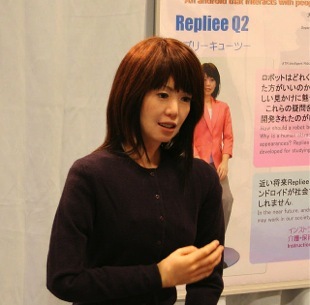 Here’s the classic picture of an uncanny valley robot. This concept has attracted a lot of attention, both in academic research and in popular culture; it’s generated some very thought-provoking ideas. So, in conclusion, liminal spaces are probably one example of a much wider phenomenon, namely that most human beings dislike ambiguity, particularly when one of the possible interpretations is threatening. The movie scene that I started with, from Byzantium, piles one threatening ambiguity on another. The vampire waiting at the threshold is neither truly human nor truly non-human; the threshold is neither completely inside the house (which should be a place of safety) nor completely outside it; the seaside town is neither completely of the land nor of the sea; the town is a resort, out of season, so neither properly a place of entertainment nor properly a normal town. That’s the dark side of ambiguity; is there a light side? The answer is that yes, there can be a light side, as described below. You can show the possible resolutions of ambiguity as a matrix, like this. Most people enjoy ambiguity when the possible interpretations are non-threatening; examples include mental puzzles, abstract art and “visual jokes” such as images that can be parsed in two different ways. I’ve blogged about this here. Mental puzzles such as crosswords and riddles probably also fit into this category. Almost everyone enjoys ambiguity where the initial appearance is threatening, but the actual resolution is very different, and non-threatening; this is the basis of humour, which I’ve blogged about here. What about situations where the actual resolution involves bad news for someone or something? The short answer is that I’m not sure. There’s been a lot of good work on the physiological mechanisms of response to threatening situations, but that’s different from what I’m talking about here. There’s also a lot of interesting work on the tropes in horror movies and related media, but again, that’s a different issue. There may well be a literature on this aspect of the cognitive mechanisms that I’m looking at in this article, but I haven’t bumped into it yet. What follows next is therefore speculative. If the switch is from harmless appearance to sudden realisation that the situation is actually scary, the usual reaction is visceral shock. Some people find that situation genuinely funny, particularly if they’re observing it happening to someone else, but that perception is generally viewed as sadistic “sick humour” in current society. If the switch is from initial apparent scariness to a realisation that the situation is actually scary in a different way, then a common response is despairing horror; this is a classic plot device in horror movies, either as a bleak ending, or as the low point from which the protagonist fights back. Again, some people might find this genuinely funny, but this perception is not the norm. So where does dark humour fit in? I think that a key feature of dark humour is that it arises from empathy for the individual in the scary situation, whereas sick humour does not show any empathy for that individual. Dark humour is common among people who have chosen to work in a role that involves helping people in scary situations, often at personal risk. But if they care, why do they make jokes about it? I think that dark humour takes us back to the same mechanism that drives some people’s attraction to scary things and scary places. I suspect that what’s going on is a desire to master the scariness. Ghost stories and horror movies provide a mechanism for mastering the scariness via fiction, through becoming familiar with the object of fear and learning about its limitations and about ways of handling it. Dark humour probably falls into the same category. It gives you a coping strategy that lets you see the situation in a different way. There are also ways of mastering the scariness via physical actions. Extreme sports confront the object of fear within set boundaries – for instance, climbing or bungee jumping. “Prepping” is another form, that involves making physical and organisational preparations for societal breakdown. Rituals are another classic mechanism for dealing with frightening unknowns, taking us back to the starting point of this article. In the past, rituals often involved negotiation with the scary entity. Iron Age Celtic societies, for instance, offered gifts to the deities of the underworld. 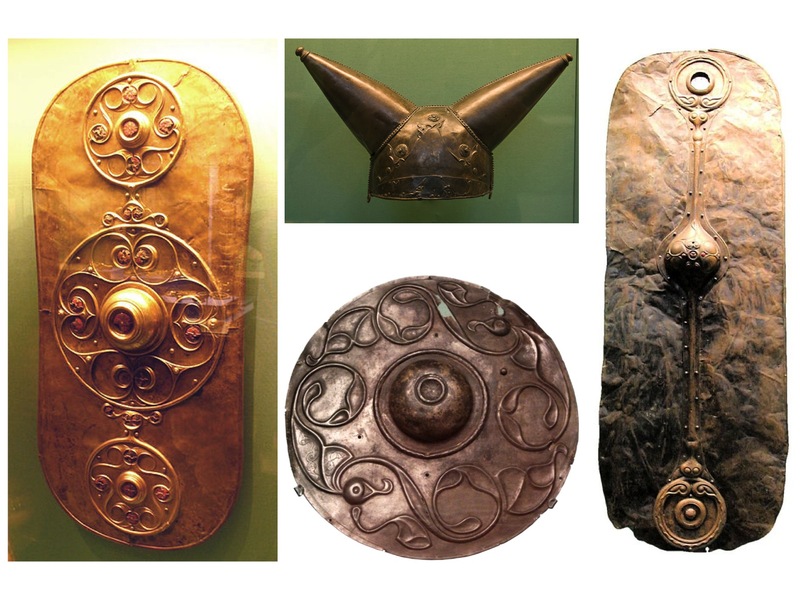 Some of the most spectacular remaining pieces of Celtic art were such gifts, offered in places where the Celts believed that our world joined the underworld – frightening, liminal places, such as swamps, that were neither land nor water. Here are some examples. 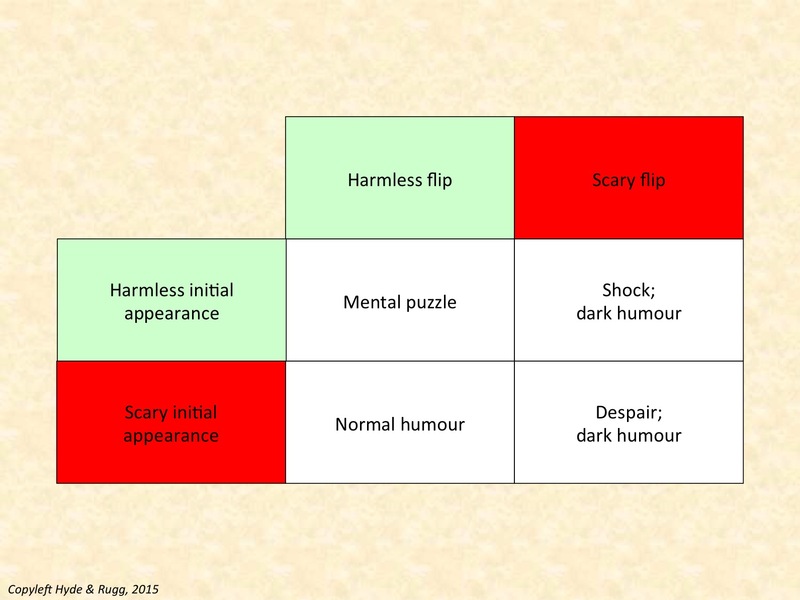 So, in summary: I think that liminal places are perceived as scary because of human problems with categorisation. On which prosaic note, I’ll end. This entry was posted in categorisation, humour, theology and tagged horror, liminal places, Necker shifts, sacred and profane, transitions, uncanny valley, votive offerings by hydeandrugg. Bookmark the permalink. Interesting article, it reminded me of something that came up on the TV panel quiz show “QI”. They mentioned that people are more likely to forget things when moving from room to room, the process of passing from one space to another seems to require a shift in mental state to be ready for the new area. Interesting how this fits in with the ideas of liminal spaces in social anthropology. Also I am researching topological mapping for robots, and its interesting that when a robot is “between” topological places in its internal map, there is greater uncertainty in its intern state, and the robot must essential push on uncertainly until the new topological place is detected. It is interesting to think about how robots should treat such physical liminal spaces. I guess I should do some follow up reading in cognitive sciences. Your comment has got me wondering about whether the same problem might occur on the roads, when drivers move from one context to another (for instance, off a main road into a suburban street). Regarding robots: I’ve found AI invaluable as a window into the issues involved in solving everyday problems, particularly with regard to what constitutes an error. Often, as with the topological mapping that you mention, there isn’t a normatively “correct” solution; this is something that traditional logic never really recognised.